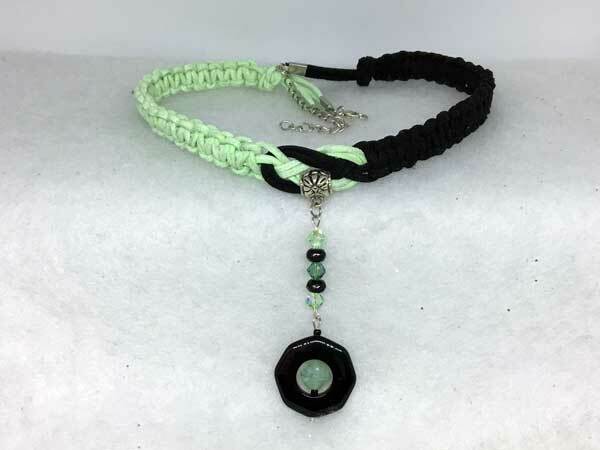 This corded necklace is made using nylon/spandex cording. The length can vary from about 16 1/4 to 19 1/2 inches with a center jeweled piece that adds 2 3/4 inches. It is done in a mint green and black. The jeweled piece starts with a gorgeous run of sparkling bicone crystals in mint green and a darker green, all separated by fully-faceted black glass rondelles. Hanging from that is an octagonal black onyx donut with a twisted adventurine in the center. Love the sparkle of this one!